Oklahoma: Over the last week I, Nathalia Grachet (OSU graduate student), and Brian Olson (OSU A&P) extensively looked at wheat around Stillwater, and in central (Minco, Apache), southwestern (Granite), and north central (Lahoma) Oklahoma. Additionally, OSU Wheat Breeder Brett Carver examined his plots at numerous locations in central, southwestern OK as well as at Stillwater, and Dr. Art Klatt (OSU Wheat Geneticist) examined trials around Stillwater and Perkins. Wheat in southwestern Oklahoma was damaged from drought and freeze, and little disease was discernible. Wheat in southwestern Oklahoma (where it was possible) appeared to be at various states of head emergence, and in a few cases was just starting to flower. In central OK, wheat was in various stages of heading. Around Stillwater, wheat was just starting head emergence, while at Lahoma wheat was mostly just approaching GS 10 (boot stage). However, there seems to be quite a bit of variability regarding stage of maturity depending on variety and planting date. No leaf rust was observed at any location. The “hot spot” of stripe rust we found at Minco is still active, but my previous update incorrectly identified ‘Duster’ as the variety with the most severe stripe rust. Actually that was ‘Garrison’. Stripe rust also was on Duster but not to the same severity nor was significant stripe rust on the flag leaves of Duster. This is the only location where we observed significant stripe rust. We also observed powdery mildew and leaf spotting on lower to mid leaves at many locations. Primarily the leaf spotting appeared to be septoria/stagonospora with some tan spot mixed in, and as expected is usually somewhat more severe in no- or low-till fields. Barley yellow dwarf was commonly observed at many locations with variable severity, but it was often difficult to differentiate damage between BYD, freeze, and drought. Wheat streak mosaic also was observed across the areas examined (see photo below). An increasing number of samples from around western OK have kept Jen Olson (Plant Disease Diagnostician) busy. Most of these samples have tested positive for BYDV, WSMV, or both, but no high plains virus or Triticum mosaic virus has been detected. This includes the Stillwater area where I have never before (since 1982) observed WSM. 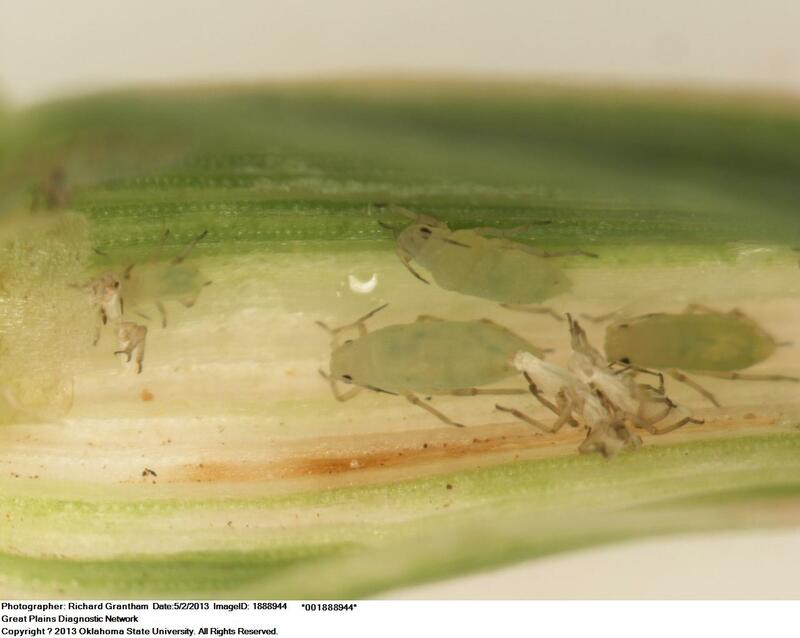 Another interesting find here at Stillwater included occurrence of Russian Wheat Aphid, which was confirmed by Dr. Rick Grantham (Director of the Plant Disease and Insect Diagnostic Lab – photos below taken by Rick). 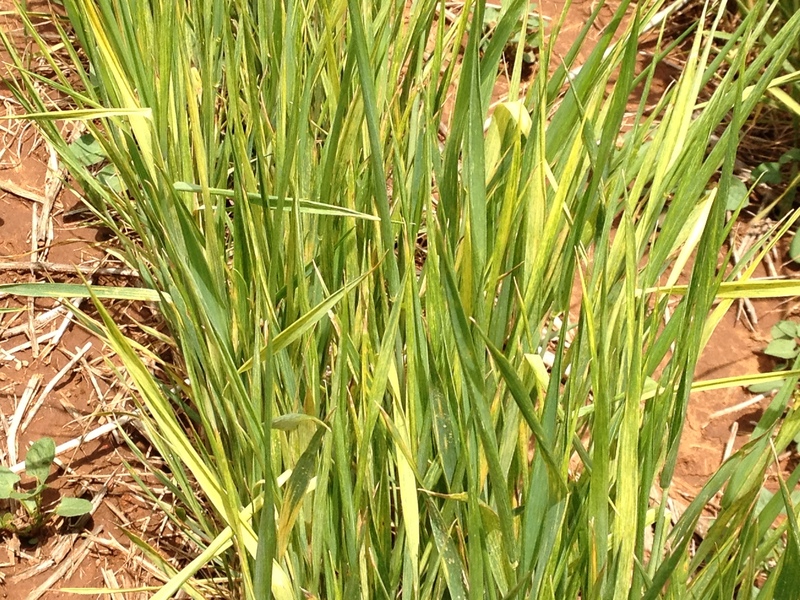 By osuwheat in Bob Hunger, disease on May 6, 2013 .